The death of Madame Viardot-García at the advanced age of eighty-nine, brings to a close the history of the famous García family—that remarkable quartet of father, son and two daughters, who exerted so strong an infatuation upon the musical life of the past century. Such artists as Manuel García (Popolo di Vincente) the older, Manuel García, the son, Malibran and Pauline Viardot-García—who were both only artists by the grace of God, but also possessed the rare acquired attribute of supreme musicianship—are features of musical history, and any book which has for its subject a discussion of the art of singing and its most illustrious representatives, must devote a long chapter to the García family and its century long services to art. When a woman of the unique distinction of Madame Viardot-García has gone out from among the living, there will be many of her former pupils and friends who will take a melancholy pleasure in recalling memories of her gracious personality and artistic activity, and it is a chapter of these personal reminiscences which Madam Schoen-René, the well-known singing teacher of Berlin, has been kind enough to permit me to pass along to the readers of the "Musical Leader." 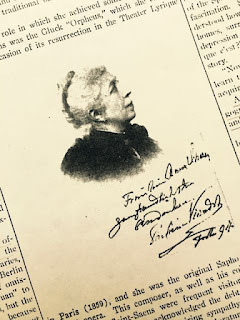 During a period lasting more than two decades, Madam Schoen-René had the privilege of absorbing the pedagogical ideas of Madame Viardot, and her distinguished brother, Manuel García. C. V. K.
When the news of Madame Viardot's death reached me the first things that came into my mind was a remark she made to me a few years ago. 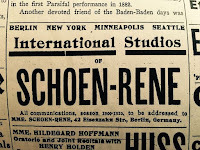 I had gone by appointment to her studio, she having been gracious enough to promise an audition to my young pupil, George Meader, whom I had brought over from America in his European career. Very great claims had been made upon her time and strength that day, and thinking she looked rather fatigued, I said to her: "Perhaps you would rather postpone our appointment, as you must be very tired." Her answer was: "Mais non, non enfant! Sanchez que quand le Viardot ne travaillera plus, elle ne sera plus!" And it was as she said! A cessation of work with her, would mean a cessation of life, and is characteristic of the enormous vitality and indomitable energy of this remarkable woman that she worked until three days before her death and then died siting in her chair. 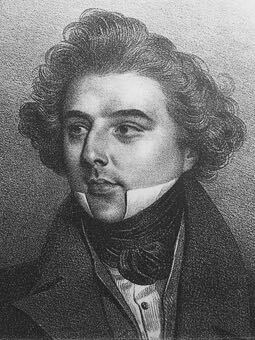 I first made the acquaintance of Madame Viardot when I was a very young singer, and such a rare combination of genius, hearts and high intelligence, it is vouchsafed to one to meet only once in a lifetime. She was not only one of the greatest singers and artists, but one of the greatest musicians of the past century. Her brother, Manuel García, always said to me of her: "She was the greatest of us all," by which he meant not only the singularly gifted García family, but all of the distinguished coterie of singers—among them a Malibran, Jenny Lind, Grisi, Scaria, Stockhausen—who were fellow students of Madam Viardot in the studio of her brother. More is said and read now-a-days about the beautiful and gifted Malibran, because she was snatched away by an accident just at the time when she had commenced what promised to be a glorious career, and when all Europe was thronged to hear "The Malibran," and for this reason a halo cast by distance and a tragic fate hangs about her history. 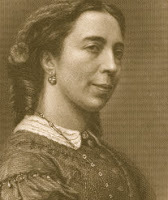 But Pauline Viardot-García, the younger sister, fulfilled her artistic career, and then retired to devote the remainder of her ninety years to the exercise of the pedagogical gifts, so pronounced in the García family. Madame Viardot never lived for herself, her family, nor the individual! She conceived her mission to be the broader one of serving her art, and any one who was sincerely and genuinely connected with any phase of this art, came in for a share of her interest. No on ever went out from an audition or a conversation the her without taking with him a fresh store of courage and inspiration. In 1865 she established herself in Baden-Baden where her home was at once the rendezvous of the aspiring singers and the great musicians of that time. Among her admirers was Richard Wagner, who advised his singers to study the bel canto and the art of singing Mozart, from Madame Viardot, as a solid foundation for the future dramatic work he would require of them. Among those who followed his advice, and built up their art upon this sure foundation, was Albert Neimann, the great Wagnerian tenor of the Berlin opera, of whom Madame Viardot said that he was the only tenor she new who had a genuine trill—and Marianne Brandt, the incomparable artist, who created the Kundry in the first Parsifal performance in 1882. Another devoted friend of the Baden-Baden days was Johannes Brahms, and when any one of use was studying a Brahms song, it was sure to recall to her mind the circumstances under which she first heard it with Brahms himself acting as her accompanist. Another Brahms reminiscent had to do with his notorious, and as she thought, pernicious habit of early rising. 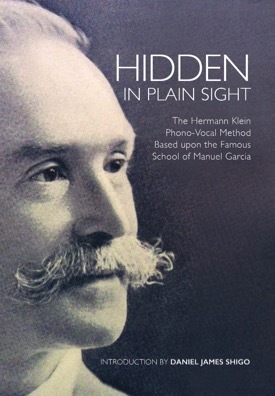 "I loved Hans, but not when he appeared under my windows early on the morning of every July 18th, to usher in my birthday with a chorus of woman's voices, selected and trained from among my pupils. It used to annoy me to be aroused from my righteous slumbers, and I once threatened to cool their ardor by emptying a pitcher of water upon their heads." Madame Viardot was one of the first to recognize Brahms' talent, and not only encouraged who shy young composer, but exercised an undeniable influence upon his lyrical expression by her shape and sound criticisms. Other pupils of the Baden-Baden days were Pauline Lucca, Desire Artot de Padilla, Madame Schulz von Asten, Madam Orgeni, Madame Colonne, Madame Cavallo, and others. She was a teacher of great artists, who have reverently handed down her traditions. It was in Baden-Baden that the great Russian novelist Turgieneff first came into her life. It is easy to understand how a woman of her unusual mental capacity and singular fascination should have taken captive the fancy of a kindred mind, and impelled him to forsake country and family to be near her during the last twenty years of his life. To him she furnished the same inspiration that George Sand once did to Chopin, or Mathilde Wesendonk to the impressionable mind of Richard Wagner. 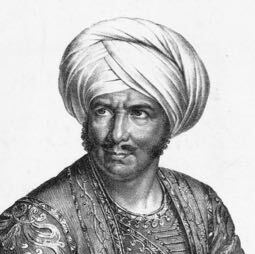 Turgieneff himself has admitted the doubt of admiration he owed to his high minded friend, and in his "Triumph gesang der Liebe," a direct tribute is paid the woman who had fascinated and fettered this man of genius. 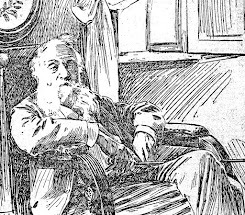 His fortune, estate of Bongival in the vicinity of Paris, his literary legacy, were all bequeathed to Madame Viardot, and should the correspondence between these two gifted friends ever be made public (from a personal standpoint always a thing to be deplored), it would undoubtedly have the same charm for the reader as the Browning correspondence or the Wesendonk letters. The idea has always prevailed that Madam Viardot withheld her recognition from the trend of modern music, but this is erroneous. She had the greatest admiration for Richard Wagner's genius and intelligence, the music of Cornelius, Hugo Wolf, Richard Strauss and even the most ultra modern of them all, Claude Debussy, she knew intimately, and never for a moment denied its beauty and its raison d'être. But she regarded it as dangerous for untrained voices, and considered that to be able to give these songs their fullest expression, without injuring the voice, required an unusually solid and thorough study of the art of bel canto. She was fond of saying that "there comes a time when music like any other art reaches a crisis, and just now the mode of expression of the age is that of intense realism; but the extreme once touched, it gradually flows back again into its normal channels of beauty of tone an purity of contour." Madame Viardot was recognized as the greatest Mozart authority of the last century. She had her traditions at first hand from her father, not only the good fortune of creating many of the tenor roles but was admitted to the select circle of the Mozart family in Vienna. He believed it to be his mission to preserve the traditions of Mozart for the next generation of singers, and it is therefor not strange that Madame Viardot should have looked upon Mozart as her musical Bible, and expounded its teachings as no second has done. In 1885, when the manuscript of "Don Juan" was offered for sale in England, and had been refused by the British museum, the Berlin and Vienna Royal libraries, she bought it for the sum of £500. Later the Berlin library sought to make good this remarkable sin of omission by endeavoring to buy from her the "Don Juan" to add to its famous collection of Mozart manuscripts, but the offer was roundly declined, chiefly, it is said, because of Madame Viardot's strong anti-Prussian feeling. About fifteen years ago, she presented the manuscript to the musical archives of the Paris Conservatoire, but retained the right to keep it in her possession as long as she lived. As a matter of fact, she had great reason to like Prussian institutions, as both she and her pupils received warm recognition in the Prussian capital, and at the time which has been called the "Golden Age" of the Berlin opera, nearly all the leading singers were Viardot pupils. For a short time, Madame Viardot was the teacher of Madame Marchesi, which rather curious coincidence came about in this way: Manuel García, was very ill with typhoid fever, and as he did not wish to disband his large class of international pupils, he persuaded his young sister to take over his work. Among the pupils who presented themselves during the lesson hours was a young girl who have her name as Mathilde Grumman, later to be know as the distinguished singing teacher, Madame Mathilde Marchesi. Not only great singers and artists when out of her studio, but distinguished composers went in to profit by the intelligent advice she was ever so ready to give. Among them was Meyerbeer, and it was Madame Viardot he had in mind, when he wrote the big role of "Fides" in Le Prophete. It was she who created the role at the Paris Grand Opera and in Berlin and the Viardot cadenzas have remained the traditional ones for the Fides of succeeding generations. Another role in which she achieved some of her greatest triumphs was the Gluck "Orpheus," which she created on the occasion of its resurrection in the Theatre Lyrique in Paris (1859), and she was the original Sapho of the Gounod opera. 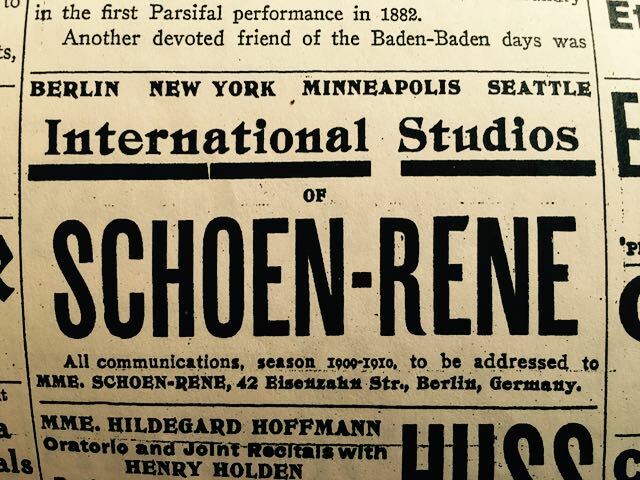 This composer, as well as he colleagues, Massenet and Saint-Saens were frequent visitors to her studio. and have frankly acknowledged the debt they owe to her musical intuition and inspiring sympathy. 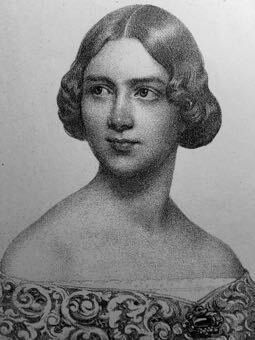 Once, after hearing the young coloratura, Marcella Sembrich, she said to Ambroise Thomas: "Here is a young singer who will make a great career; you would do well to write an opera for her!" Among the younger generation of singer who have hone forth from her studio is Madam Greville Reache, of whom she said to me that she considered her the greatest Delilah, and that Saint-Saens corroborated her opinion; another was the late Mrs. Henry Wood, of London. Madam Viardot strongly opposed the theory of vocal limitations which characterize the present generation of singers. She held that every singer must have an absolute equalized compass of two octaves, and that the voice must be flexible, and at the same time so broad as to be capable of singing roles widely differing in character. From her father she learned the justification of this theory and was herself able to prove it by alternating between Orpheus and Rosina or Fides and Lucia. I have often heard her say that Madam Lilli Lehmann was the last living exponent of such a degree of artistic versatility as to enable her to sing with equal perfection a Mozart or a Wagnerian role. A lesson in the Viardot studio was a thing to be counted by seconds and minutes, but was always a genuine artistic experience. "Bon jour, ma petite! Comment allez-vous mon enfant!" was her invariable greeting, and indeed all of us felt like little children when we stood in the presence of this great woman. She was always exquisitely dressed, and with her crown of snow-white hair under which flashed the coal-black eyes of the Spaniard, she exercised an immediate and irresistible fascination. She had the greatest amount of tact, and understood how to extract from the pupils an account of their home, surroundings, and financial condition. A look of depression at once elicited from her an interested "qu'est-ce que c'est?" And soon she was in possession of the entire story. "Now let us sing something very gay, for you must learn to sing just contrary to the way you feel, and thus acquire the imagination of expression!" As soon as the lesson began, she was the strict pedagogue and all personal feeling was merged into a serious and objective attitude toward the work at hand. She was always her own accompanist, and as she had been a favorite pupil of Liszt's, her work at the piano was alway done in a masterly manner. I should like to add that one proof of her phenomenal musicianship was to be found in the fact that she played every opera from memory. She had a virile, masculine attack and the first emphatic chord she played was naturally calculated to arouse a fluttering of alarm not only in the heart of the timid voice, but even of the better poised and more experienced artists. Courage soon came, and after many repetitions the coveted word of praise was gained. "Enfant C. A! Va! Allez!" Often on very critical days this reassuring point was not easily reached and then she would cry half in jest, and half in earnest "Sapristi!" or some other term equally drastic. But as soon as she saw the signals of distress flying in the face or eyes of the pupil, she would immediately relent. "Don't be discouraged! It must come and it will come! If you had no faults, you would not be studying with me!" Until the very last she retained her incredibly sharp ear, and it was impossible to deceive her, however cleverly you though had had taken your breath in the wrong place, or sough to make good an overlooked legato connection by the use of a bit of finesse. She was looked upon as an expect diagnostician and prognosticator and I recall a rather painful episode which occurred in her studio, on the occasion of the visit which I have referred above. A singer was announced who asked if Madam would have to me try her voice. At first Madam manifested some reluctance, but when she heard that her visitor had made the trip from Leipzig to Paris for that sole purpose, and was ready to cry with disappointment, she consented. The singer then explained that she was contemplating going over in grand opera, and had been told that no one could give so expert an opinion as to the advisability of such a change as Madam Viardot. 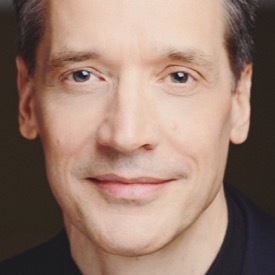 When the fact that it was the latest operetta success of Germany and been borne in upon Madam, she felt that dignity had been trifled with, and was inclined to show but scant mercy to her visitor. She was gradually appeased, however, and made an appointment for the next day, adding with severity: "But mind, that you bring me no more such rubbish! How am I to judge of your qualifications for grand opera of such trivial music." My young pupil, who was already fairly shaking in his hoes at the thought of his impending audition, turned to me and whispered "If she were to talk that way to me, I would sink though the floor!" Madam Viardot was equally at home in all languages; I have been in her studio when French, English, German, Italian, Spanish and Russians were present, and a stranger would have had difficulty in detecting her nationality, as she had mastered the various languages down to the subtler idioms. She had, perhaps, less real fondest for the German, but that did not prevent her form being extremely critical, and she always aid that unless the German language were faultlessly pronounced, it was the ugliest musical language in the world. She was particularly severe with her German pupils, and when she encountered especially obstinate consonants she would say ironically: "Now tell me from what part of Germany do yo come!" I must not forget to mention that Madam Viardot, who had the kindest heart imaginable, could be roused to a real exhibition of temper, when she found herself the victim of an ungrateful pupil or a faithless friend. "There is in the whole world nothing lower and more despicable than ingrates and liars. They may have success for a time, but the day or reckoning will surely come." On this point, she was bitter and unrelenting, and any one who had forfeited her favor by an exhibition of these dastardly qualities, could never hope to be reinstated in her good graces. Every lesson with his wonderful woman was a revelation, and an inspiration, and will remain an indelible memory to the hundreds of pupils, who are mourning her loss. —Anna Eugenie Schoen-René, "A Tribute to Mme. Viardot-García," The Musical Leader, June 16, 1910: 3-5.